A Supermoon happens when a Full Moon or New Moon coincides with the Moon's closest approach to Earth; also called perigee. A Super Full Moon looks around 12% to 14% bigger than its counterpart, the Micromoon. The Supermoon last November 14, 2016, is the closest Full Moon has been to Earth since January 26, 1948. The next time a Full Moon is even closer to Earth will be on November 25, 2034 (dates based on UTC time). The Leonids will peak on the night of November 17 and early morning of November 18 in 2016, just 3 days after a Full Moon. 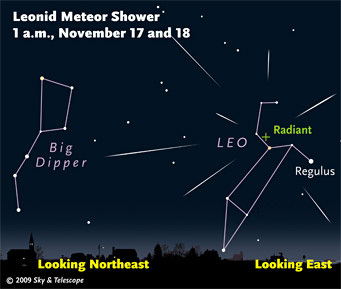 The Leonid meteor shower is annually active in the month of November and usually peaks around November 17 or 18. The shower is called Leonids because its radiant or the point in the sky where the meteors seem to emerge from, lies in the constellation Leo. The Leonids occur when the Earth passes through the debris left by the comet Tempel-Tuttle which takes around 33 years to make one orbit around the Sun. People can view about 20 meteors an hour at the peak of the Leonids meteor shower. Where to View the Leonids? The Leonids can be seen by viewers from both hemispheres. While it is not necessary to look in a particular direction to enjoy a meteor shower, astronomers suggest lying down on the ground and looking at the sky between the East and the point right above you to view the Leonids. The best time to view the Leonids is after dark, but a bright Waning Gibbous Moon may make it difficult for viewers to see many meteors. In 2016, the Geminids are expected to peak on the night of December 13 and early morning hours of December 14. A Full Moon may make viewing conditions difficult. The Geminid meteor shower can be annually observed between December 4 and December 17, with its peak activity being around December 14. The shower owes its name to the constellation Gemini from where the meteors seem to emerge from in the sky. Unlike most other meteor showers, the Geminids are associated not with a comet but with an asteroid: the 3200 Phaethon. The asteroid takes about 1.4 years to orbit around the Sun. The Geminids are considered to be one of the more spectacular meteor shower during a year, with the possibility of sighting around 120 meteors per hour at its peak. Where to View the Geminids? The Geminids can be observed from locations all around the world. While it is not necessary to look in a particular direction to enjoy a meteor shower, astronomers suggest looking towards the south to view the Geminids. 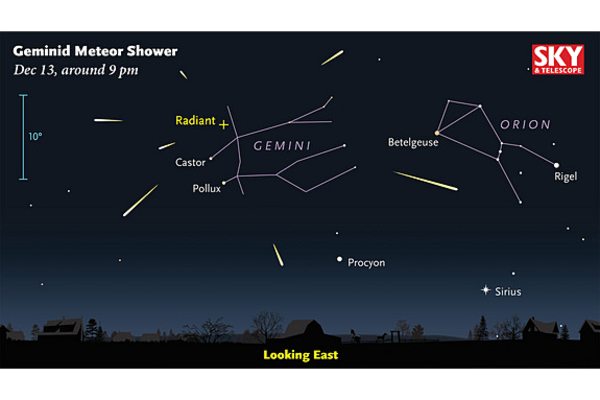 When to View the Geminids? The best time to view the Geminids is at night – after sunset and before sunrise.